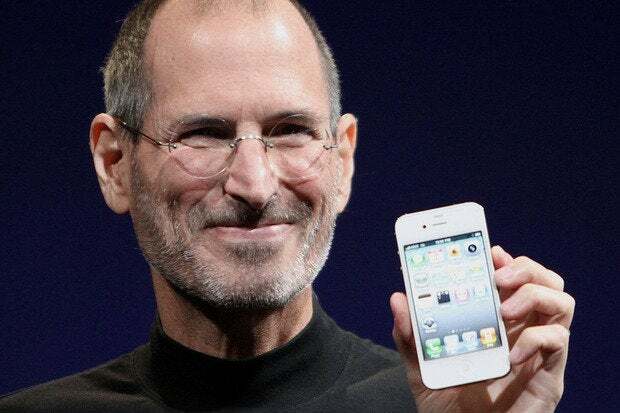 Two years and 51 weeks after his death, Steve Jobs is still teaching the technology industry how to lead. The latest lesson comes via a fascinating bit of research that explores the Apple co-founder's use of speech, including the classic rhetorical devices taught by Aristotle more than 2,300 years ago, and it links his success as a leader to them. The Jobs "reality distortion field" was so powerful he could get a team of lawyers trying to nail him on a stock-fraud charge to feel sorry for him during a deposition. He could also convince his audience that a patently hostile business move was nothing of the sort. Jobs could use his rhetorical tricks to charm -- and journalists who knew him invariably say he radiated charisma. He did. But what does that actually mean? "Charisma is not a magical quality, and leadership is realized when an individual succeeds in attempting to frame and define the reality to others," write Loizos Heracleous, a professor of strategy at Warwick Business School, and Laura Alexa Klaering, an analyst at Geometry Global. The pair recently published a study of Jobs' rhetorical skills. They examined three disparate situations, two of which could have ended badly, and show how Jobs' studied use of speech won the day. In all three instances, he conveyed a consistent message while tailoring it to distinct audiences, and he was careful to use the appropriate style and rhetorical devices. There's no way to know if Jobs privately studied rhetoric, but his mastery of pathos, logos, and ethos, as Aristotle called them, provides lessons for other leaders -- and for anyone striving to make a convincing argument. Pathos: Getting the opposition to think "poor, poor Steve"
Talk about a hostile audience. In March 2008, Jobs was being deposed in a case that could have resulted in a criminal indictment. Apple, like other companies that year, was being investigated for backdating options, a violation of securities law. As CEO at the time, he was responsible. I spent a lot of time trying to take care of people at Apple and to, you know, surprise and delight them with what a career at Apple could be -- could mean to them and their families. And I felt that the board wasn't really doing the same with me. So I was hurt. I had been working, you know, I don't know, four years, five years of my life and not seeing my family very much and stuff, and I just felt like there is nobody looking out for me here. Notice what he did. He wasn't defensive and he wasn't obviously stonewalling, though he actually was. Instead he used pathos, the means of persuasion that appeals to the audience's emotions. Jobs then went on to explain his worries about losing key people to the competition, and options were the key to keeping them on board. He portrayed himself, the researchers note, "as a self-sacrificing businessman who places the company above his own interests." That may sound like baloney when read out of context, but it was quite effective, along with his studied use of another rhetorical device: repetition. He used the word "concerned" over and over again and amplified his speech with adjectives like "very," "really," and "big" to drive home his point. In 2005, Apple surprised the business world by announcing it would abandon IBM's PowerPC architecture in favor of Intel's x86 platform. Jobs was subjected to a hostile interview on CNBC, where he gave a great demonstration of what it means to define reality. As many journalists tend to do, the interviewer wanted to frame the discussion around the "business is war" metaphor, so CNBC used a fast-paced, provocative style. But Jobs wouldn't bite. He was calm and professorial, using logos, a device that relies on logical argumentation. Even more significant than Jobs' demeanor was his attempt to reframe the discussion. He countered the journalist's metaphor with one of his own: "business as a journey." That had the effect of "presenting Apple's decision to change suppliers as a natural, uncontentious one in the normal course of business rather than a radical break from an existing dominant supplier," said the researchers. The interviewer used loaded words and phrases, calling the IBM-Apple relationship "tempestuous," saying Apple "unplugged it" and Jobs was "harshly critical" of the company's product road map. Jobs, though, made a point of praising PowerPC products still in the Apple pipeline: "We've got some great PowerPC products today, and we've even got some PowerPC machines in the pipeline that we haven't introduced yet. And this is gonna be a more gradual transition." Taking care not to rub salt in IBM's wound probably made it easier for the companies to resume their partnership this year. But when Jobs knew he was on friendly turf, he'd push the charm button and unleash the metaphors. At the D8 conference in 2010, for example, he used the four seasons as a metaphor for product development, saying that Apple chooses technologies in the "spring" of their lifecycle. He also used human lifecycles: Old products, though, are "the graveyards of technology." When he rejoined Apple, the company "was on the way to oblivion" but is now experiencing "a rebirth." Products, he implied are part of the "circle of life." That's ethos, a persuasive appeal based on the character of the speaker. Out of context, those metaphors may sound a bit hokey. But U.S. presidents who are viewed as charismatic used twice the number of metaphors in their speeches as presidents who weren't, write Heracleous and Klaering. Jobs was no politician, but he could outtalk the best of them -- not a bad lesson for a CEO to learn.